I recently came across this inspiring little quotation from the late Basil, Cardinal Hume, Archbishop of Westminster, sometime Abbot of Ampleforth. I can't find it on the internet, I assume it's come from one of his books or talks. It denies what no-one claims, that Latin is the only determinant of the dignity and reverence of worship (that it is a necessary and sufficient condition), just as no one claims that speed is the only determinant of safe driving. But it presents this thwacking of a straw man in such as way as to imply something quite different: that Latin makes no contribution to dignity and reverence in worship (like the claim that speed is irrelevant to road safety). 'It does not matter...'? The quoted statement airly dismisses the possibility as not worth considering: our attention is drawn away from the irrelevant issue, Latin, to the relevant issue, dignity and reverence. Can we conclude that Latin is irrelevant to dignity and reverence, from the statement? Not strictly logically, but somehow the view that it is relevant is made to seem silly. This is a rhetorical trick. On ancient languages in general: By their use in sacred liturgies and in versions of Holy Scripture, they have remained in force in certain regions even to the present day, bearing constant witness to the living voice of antiquity. The employment of Latin has recently been contested in many quarters, and many are asking what the mind of the Apostolic See is in this matter. We have therefore decided to issue the timely directives contained in this document, so as to ensure that the ancient and uninterrupted use of Latin be maintained and, where necessary, restored. So you might say that the use of Latin would be a way of making an act or worship more dignified, more reverent, for at least four reasons: through its inherent 'majesty', its connection with antiquity, its universality, and its consecration by long use by the Church. Cardinal Hume could not have failed to have been familiar with this document. But he chose, not only to ignore it, but by implication to ridicule the views of people who took the immemorial teaching of the Church on the subject of liturgical language, which it reiterates, seriously. For this language is, within the Latin Church, an abundant well-spring of Christian civilisation and a very rich treasure-trove of devotion. 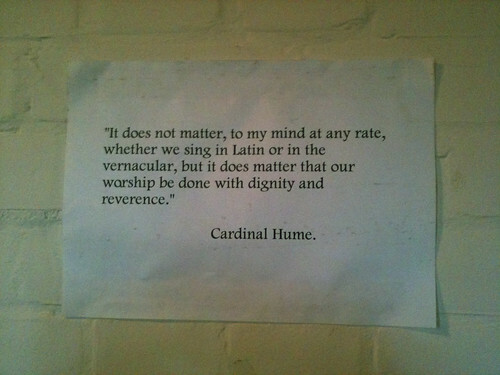 Oh, but 'It does not matter': to your mind, Cardinal Hume, not to that of the Popes. It did matter to Hume of course ... as anyone who tried to get mass said in Latin in his diocese would have found out. A crucial part of the importance of Latin is that it is impossible to have a human community without a common language. It would be impossible to hold an ecumenical council now, because the bishops would not be able to speak to one another, as they do not share any common language. So the revival of Latin as a spoken language as well as a language of learning is essential for the Church. I received something similar from Cardinal Hume when I requested permission for an occasional Tridentine Mass in our London parish before the Pope Benedict granted us the indult. The Cardinal said that the language of the Mass did not matter. What mattered was the reality of the Mass.